Let’s work on an example. 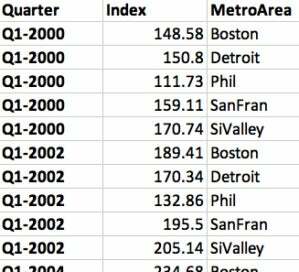 Here, I’ll read in a spreadsheet of home prices in 5 U.S. metro areas: Boston, Detroit, Philadelphia, San Francisco, and San Jose (which I’m calling Silicon Valley). More specifically, data about home prices every two years, when all cities started with an index of 100 in 1995. This data runs from 2000 to 2018. I import this data using housing_data <- rio::import("housingPrices.xlsx"). If you'd like to follow along without having the spreadsheet, the code to create this data frame is at the bottom of this article. But if you want to graph that with ggplot2, you want the data in so-called tidy, or “long,” format. There's one observation per row, and no data in column names. So you can easily tell ggplot2 color by city. Right now, the city information is in column names not the data itself. One observation per row: The quarter, the home-price index value, and the Metro area. Not as easy for a person to scan, but much better for analyzing in R—especially with tidyverse packages. So, if the only version of your data was the wide version, how do you get the long version? One way is with the tidyr package’s gather function. gather() takes at least three arguments: First is the name of your data frame. Second is the name you want for your new category column—that’s called the key. And third is the name you want for your new value column, that’s called the value. After that are any columns that you want “gathered” into the new key and value columns. If you don’t supply any column names, all the columns get gathered. In this case, we want all the city columns gathered but not the Quarter column. I can exclude that with -Quarter. This version is much easier to graph with ggplot2. Just by adding group = MetroArea, my chart plots each metro area as its own series, or line. color = MetroArea gives each line a different color. Here, I’m using the same customized plot I just made, but storing it in a variable called my_customized_plot. Then I run the direct.label() function on it, with the argument last.points and a slight horizontal justification of the text. Let’s say I started off with this as tidy data, but wanted to make it “wide” to create a table that’s easier to read. Basically going from the long data frame I have now to that first version I showed with each metro area in its own column. For that, you need the opposite of gather(), which is spread(). spread() also takes data, key, and value as arguments. In this case, the data is your tidy data frame. Key is the name of the existing column where you want the values each turned into their own columns. For this data, it's MetroArea. We have one column with metro areas, and I want each metro area to be in its own column. Value is the name of the existing column that holds the values that should be spread out into the new columns. R may not know for sure whether that should be the Index column or the Quarter column unless you tell it. 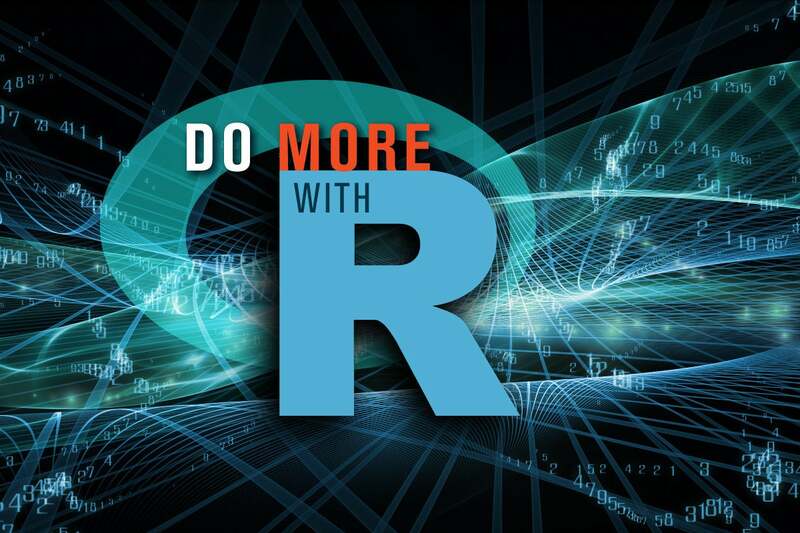 This story, "Reshape data in R with the tidyr package" was originally published by InfoWorld.